The Guardian device is charged with a standard USB charger. It takes about 2 hours to recharge the battery. 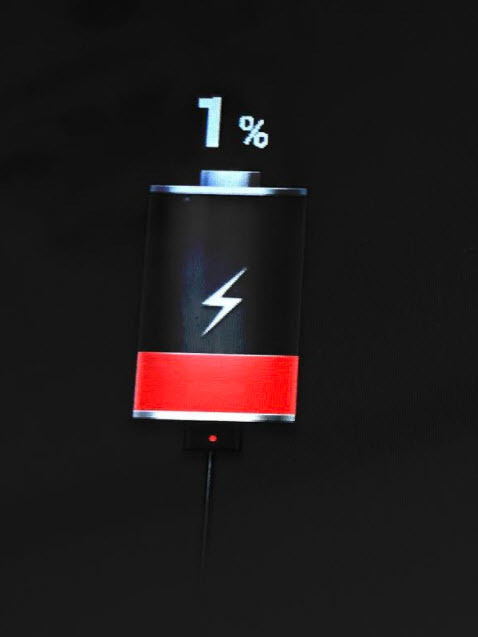 You hear the audible message of "Device is charging"
You see the message on the screen: "Screen will black out when unplugged. New User? Download AngelSense app on your mobile to get started." If message does not sound or you do not see the on screen message, turn it onby pressing the power button until it vibrates. Turning on the device is best done while it is still connected to the charger, as it may not have enough power to turn on when the battery is completely depleted. A couple of minutes after starting the device the "Device is charging" message should sound. The USB/Charging port is at the bottom of the phone and the sleeve has an opening to enable charging without removing the device from the sleeve. To avoid damage to your phone's port and cable plug, orient the plug with the port before inserting it. Insert one end of the USB Cable into the port and plug the Charger Adapter into an electrical outlet. To verify the device is charging you can also check the status bar in the app. When the device is charging, the lightning bolt appears next to the battery, and the battery is colored green. NOTE: If you see the the battery charging icon with the percentage showing on the device's entire screen, this means that the device is OFF. The device does charge while it is off and connected to the charger, so it would simply need to be powered on.